Semmes is the recipient of many awards and grants: an NEA Fellowship (1994-95), a New York Foundation for the Arts Fellowship (1997) and an award from the Art Critics International Association (2001). She has had solo exhibitions in numerous places including: Museum of Contemporary Art, Chicago; Hirshhorn Museum and Sculpture Garden, Washington, DC; Whitney Museum of American Art, New York; and Philip Morris Gallery, New York. Semmes lives in New York City and teaches at NYU and Pratt Institute. SEP 4 Art scholar and curator Patterson Sims will lecture on Semmes’ work at 5:00 p.m. in 1093 Shelby Hall. Sims’ concentration has been in Modern and Contemporary Art fields with a specialty in American Modernism and Contemporary Art. He serves as programming and operations consultant to numerous non-profit arts institutions and museum administrations. Sims is currently consulting and working on projects with several foundations, lecturing, writing, and organizing exhibitions. He is the author of books on Ellsworth Kelly, Jan Matulka, Willie Cole, and Philip Pearlstein, Charles Burchfield, Viola Frey, Georgia O’Keeffe, Ad Reinhardt, Hedda Sterne, James Surls, Betty Woodman, Andrew Wyeth, among others. His published interview with Beverly Semmes appears in the catalogue produced in conjunction with the exhibit Starcraft. Sims has been the Director of the Montclair Art Museum in Montclair, New Jersey; Deputy Director for Research Support at the Museum of Modern Art; Associate Director for Art and Exhibitions and Curator of Modern Art at the Seattle Art Museum; and Curator of American Art at the Whitney Museum of American Art. Please join us on September 5 for the public reception of the exhibition Beverly Semmes: Starcraft. The Sarah Moody Gallery of Art is supported by the College of Arts and Sciences and the Department of Art and Art History. The gallery is open Monday through Friday from 9:00 am – 4:30 pm, and Thursday evening 5:00 – 8:00 pm. The gallery is located in 103 Garland Hall in the heart of the UA campus on Woods Quad. There is no admission charge. 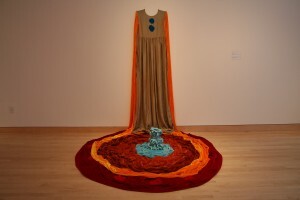 Image credit: Beverly Semmes, Olga, silk velvet, rayon velvet, taffeta, ceramic, 2007, 7 feet x 6 feet a 10 inches x 7 feet, Courtesy of the artist and Galerie Bugdahn und Kaimer, Dusseldorf, Germany.